Tritium (/ˈtrɪtiəm/ or /ˈtrɪʃiəm/) or hydrogen-3 is a rare and radioactive isotope of hydrogen, with symbol T or 3H. The nucleus of tritium (sometimes called a triton) contains one proton and two neutrons, whereas the nucleus of the common isotope hydrogen-1 ("protium") contains just one proton, and that of hydrogen-2 ("deuterium") contains one proton and one neutron. Naturally occurring tritium is extremely rare on Earth. The atmosphere has only trace amounts, formed by the interaction of its gases with cosmic rays. It can be produced by irradiating lithium metal or lithium-bearing ceramic pebbles in a nuclear reactor. 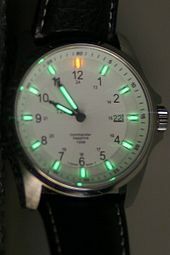 Tritium is used as a radioactive tracer, in radioluminescent light sources for watches and instruments, and, along with deuterium, as a fuel for nuclear fusion reactions with applications in energy generation and weapons. The name of this isotope is derived from Greek τρίτος (trítos), meaning "third".